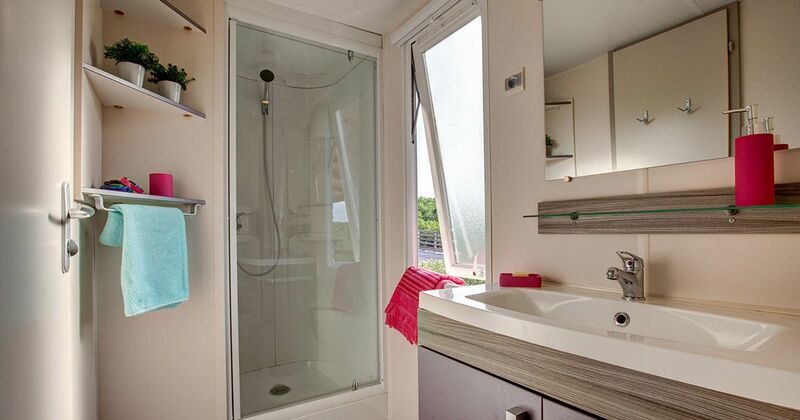 If you are travelling with a family or a group of friends made up of 4 to 6 people, You can book this mobil-home named Sunêlia Confort Natura 4/6 people. As the name implies, it is a comfortable shelter. But It's also spacious. You can spend a good time with your loved ones while enjoying a friendly and serene setting. The nature surrounding the mobil-home brings freshness into its interior. This shelter is perfect for a holiday of discovery and relaxation in the Department of Ardèche. 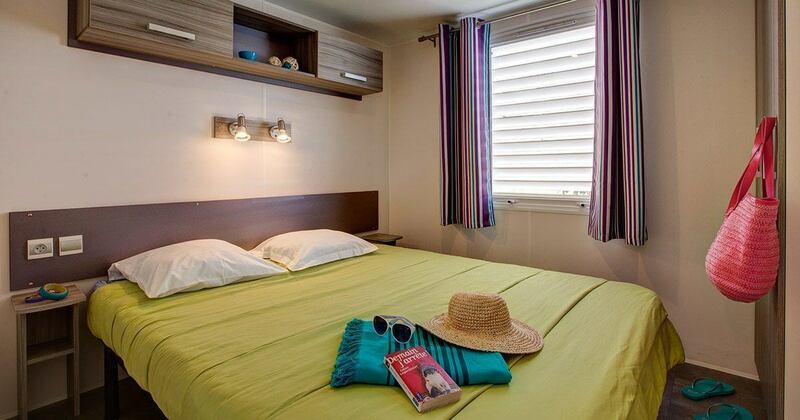 The Sunêlia Confort Natura 4/6 People has a great room perfect for parents for those who made a family Reservation. This room is equipped with a large double bed. The cottage also has another room for the Children. There are two single beds that can be reached if both people want to sleep side by Side. For those who have one or two extra people in their group and who have chosen a Sunêlia Confort Natura 4/6 people, They can turn the convertible seat of the living area into a bed. It can provide two additional bedding. 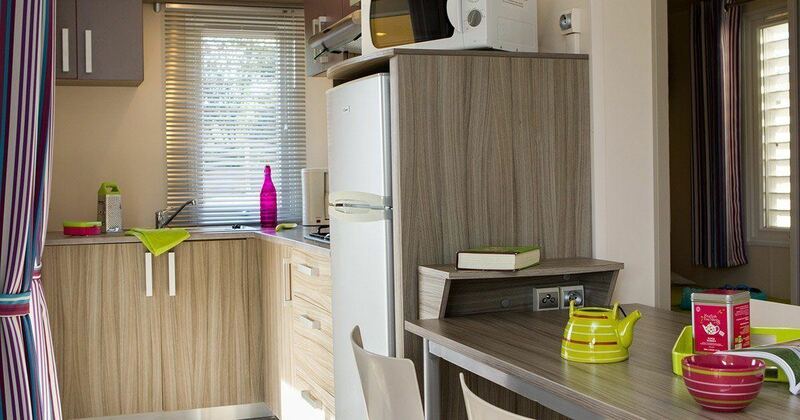 In the kitchen of this mobile home, you have a refrigerator, a microwave, baking plates and several other appliances and equipment for cooking. To eat, a lot of dishes sufficient to take the meals is also made available to the Residents. They have the choice between eating on the dining area or eating Out. indeed, The shelter has a covered terrace with garden furniture for Comfort. So the tenants have the opportunity to do some sort of picnic outside their rental. They can be found there to savor the freshness of nature that surrounds Them. Sanitary side, The Sunêlia Confort Natura 4/6 People has a bathroom with shower and washbasin. The toilet is Separated. So everyone can enjoy a hot shower before sleeping and before going out in the Morning. This Sunêlia Confort Natura 4/6 people has heating and air conditioning. It is therefore possible to spend some good times with a pleasant atmosphere to Live. It is not safe to freeze or choke on heat. This type of mobile home also has a safe. You can put all the valuables that you don't like to wear with each exit. With regard to the reception of pets, it is possible if they are outside 1 ° and 2 ° Cat. We also have to pay 6 euros per animal per night to accommodate Them. Like all those who inhabit the rentals of camping Sunelia Aluma holiday, The tenants of the Sunêlia Confort Natura 4/6 People also have the right to rent sheets or towels if they do not have them. They also have the opportunity to apply to the reception if they have special equipment or other NEEDS. They can also ask for a cleaning at the end of the Stay.